In May 2018, Paris Aéroport welcomed 9.0 million passengers, an increase of 2.1% compared with May 2017. 6.1 million passengers travelled through Paris-Charles de Gaulle (+2.1%) and 2.9 million through Paris-Orly (+2.1%). The number of connecting passengers decreased by 9.5%. The connecting rate stood at 20.3%, down by 2.0 points compared with May 2017. Since the beginning of the year, Paris Aéroport passenger traffic has increased by 2.3%, with a total of 40.5 million passengers. The number of connecting passengers has decreased by 4.9%. The connecting rate stands at 21.5%, down by 1.6 points. Passenger traffic at TAV Airports, 46.1%-owned by Groupe ADP, increased by 40.0% in May 2018 and has increased by 25.1% since the beginning of the year. Passenger traffic at Santiago de Chile Airport, 45%-owned by Groupe ADP, increased by 9.6% in May 2018 and has increased by 10.8% since the beginning of the year. 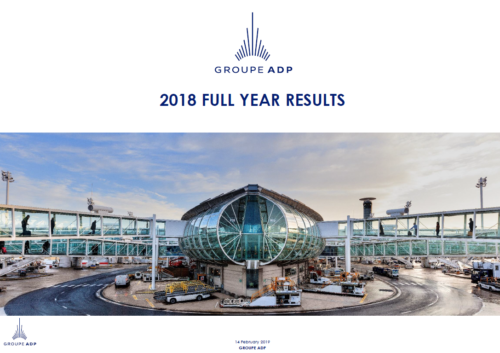 Since 19 April 2018, Groupe ADP, through its 100%-subsidiary ADP International, has owned 51% of the capital of Airport International Group, concessionary of Queen Alia International Airport (QAIA) in Amman, Jordan. Passenger traffic at Amman Airport decreased by -2.1% in May 2018 and has increased by 5.6% since the beginning of the year. Groupe ADP and TAV Airports have, a shareholding of 21% and 15%, respectively, in Zagreb Airport. To be compliant with TAV Airports presentations, ZagrebAirport traffic figures are integrated into the TAV Airports group traffic figures.